Hillary ClintonA screengrab from Hillary Clinton’s first official television ad. Donald Trump’s off-the-cuff campaign speeches have enthused Republican primary audiences all year. But some of Trump’s most controversial comments from his campaign rallies have quickly become fodder for Hillary Clinton’s television advertisements. Clinton’s first official television ad of the general election highlighted Trump’s call to supporters to “knock the crap” out of protesters at his rallies, as well as his controversial imitation of a disabled New York Times reporter. 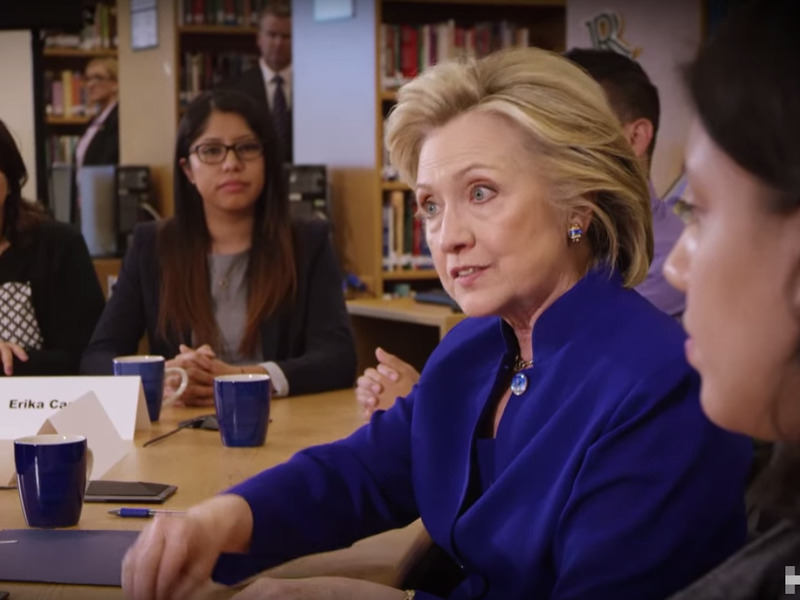 The ad attempts to cast Clinton as a steady alternative to Trump, interspersing the presumptive Republican presidential nominee’s inflammatory quips with shots of Clinton smiling and meeting with voters. “Today we face a choice about who we are as a nation,” Clinton said in the ad. “What kind of America do we want to be? Dangerous and divided, or strong and united?” Clinton said. According to The New York Times, the ad will begin airing on Thursday in several swing states. Trump took to Twitter on Sunday to respond, denying that he mocked Times reporter Serge Kovaleski over his disability. Clinton made a false ad about me where I was imitating a reporter GROVELING after he changed his story. I would NEVER mock disabled. Shame! Though Clinton’s ad on Sunday is the campaign’s first official television buy of the general election, her super PAC has also been working to use Trump’s most eyebrow-raising comments against him in viral ads. A top super PAC supporting the former secretary of state has already provoked Trump’s ire over its ads hammering the real-estate magnate for his derogatory statements about women’s bodies.